Retinal ganglion cells (RGCs) are large, complex cells. The RGCs begin in the inner plexiform layer (IPL), the layer formed by the dendrites of the RGCs. Here they synapse with the bipolar and amacrine cells of the middle retina. Subsequently, they extend from the inner retina and travel all the way to the lateral geniculate nucleus (LGN) in the midbrain. 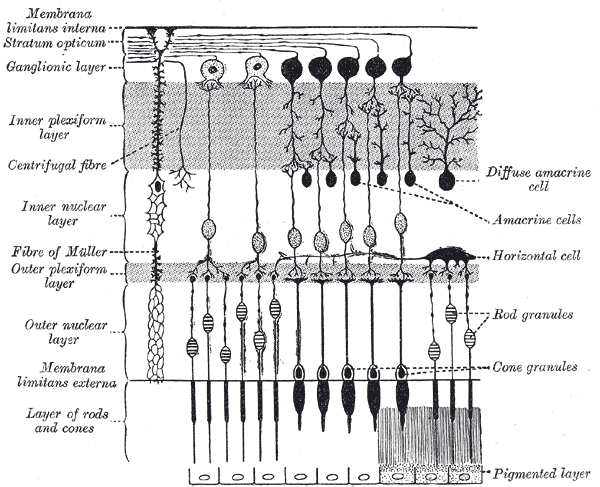 Their cell bodies (soma) make up the ganglion cell layer (GCL), while the axons emerging from the RGCs form the retinal nerve fiber layer (RNFL). 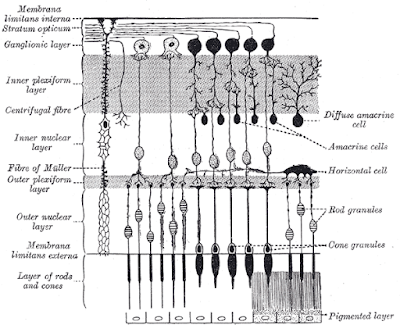 The axons traverse the retina; converge at the scleral foramen forming the neuro-retinal rim (NRR) of the optic nerve head (ONH). Subsequently, they continue onto the optic chiasm and LGN. Glaucoma evaluation by macular imaging was first suggested by Zeimer. Since the RNFL is only composed of axons, assessing the RGC itself might be a more direct way to measure ocular damage due to glaucoma rather than measurement of the circumpapillary RNFL (cpRNFL). On a cross-sectional OCT image, all the 3 segments of the ganglion cells (IPL, GCL & RNFL) are known as ganglion cell complex (GCC). Approximately 50% of the total RGCs in the retina synapse in the central 5 mm of the macula. 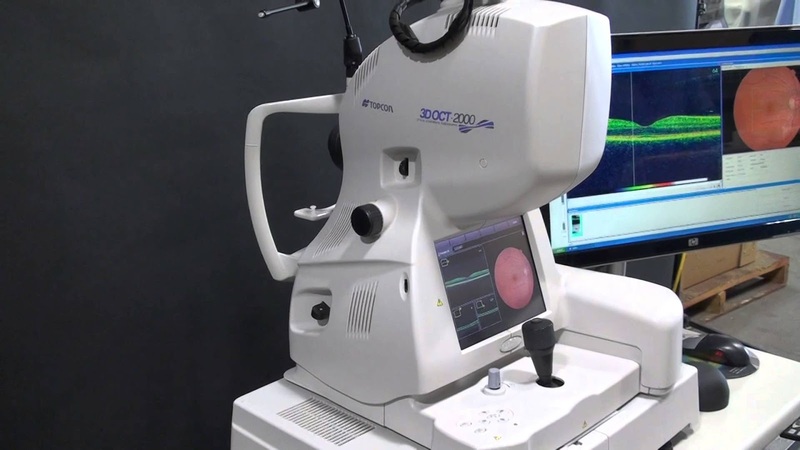 Thus, all OCT machines perform GCC scans that are centered on the fovea to a diameter of between 6-9 mm. Depending on the machine, the average GCC thickness is approximately 95-100 microns. Studies have shown that the receiver area under the curve (AUC) for GCC scans is about 0.92. This is better than the AUC for RNFL which is around 0.91. 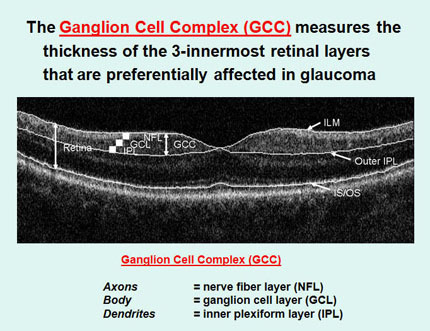 It is assumed that this is because in glaucoma the inner retinal layers are affected more compared to the outer retinal layers. The Cirrus OCT (Zeiss) uses a "macular cube (512x128) acquisition protocol” which generates a cube through a 6 mm square grid of 128 B-scans, each consisting of 512 A-scans. Another 200x200 protocol acquires 200 A and B scans each. A built-in GCC analysis algorithm software detects and measures the thickness of macular GCC in a 6x6x2 mm elliptical annulus centered on the fovea. The annulus consists of an inner vertical diameter of 1 mm chosen to exclude parts of the fovea where the layers are very thin and difficult to detect accurately and an outer vertical diameter of 4 mm, chosen to coincide with the area at which the GCC again becomes thin and difficult to detect. The thickness values recorded are mean thickness, mean minimum thickness (thickness of the thinnest sector) and the topography of the macular region divided into 6 sectors, expressed in micrometers: superior, inferior, superior & inferior temporal and superior & inferior nasal. Each spoke represents the average number of pixels along that spoke. The data is compared with a normative database in the form of maps, graphs and tables in which the colors are the same as in the ONH protocol. GCC thickness in the normal range is represented by green backgrounds. The thinnest 5- and 1% of measurements are represented by yellow and red backgrounds respectively. The hypernormal (95th-100th percentiles) thicknesses are presented in white color. The thickness acquisition leads to development of "Thickness Maps". The results are then compared with normative data to form the "Deviation Maps". It is found that early glaucoma manifests changes in the mean minimum thickness in the inferior temporal sector. Thickness acquisition map: It shows the thickness of the GCL+IPL in the 6mm x 6mm cube, represented as an elliptical annulus centered about the fovea. Deviation map: This shows a comparison of the results compared to a normative database. GCC thickness in the normal range is represented by green backgrounds. The thinnest 5- and 1% of measurements are represented by yellow and red superpixels on the gray scale photograph respectively. The hypernormal (95th-100th percentiles) thicknesses are presented in white color. Thickness table: It shows average and minimum thicknesses within the elliptical annulus. Sectoral thickness map: It is displayed in an elliptical manner divided into 6 sectors- 3 superior and 3 inferior. They are color coded similar to the RNFL thickness maps. Horizontal and vertical B-scans: These are extracted from the macular cube; with the locales marked on the macular map. 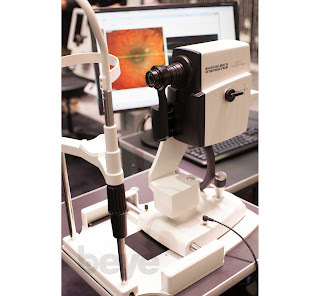 The RTVue (Optovue) measures the GCC by scanning 1 horizontal line and 15 vertical lines at 0.5 mm intervals, covering a 7 mm2 region, centered on the fovea. The machine acquires 14928 A-scans within 0.6 seconds. The results are then processed to provide thickness maps of the GCC, pattern-based parameters of Focal Loss Volume (FLV) and Global Loss Volume (GLV). The GLV is found to correspond to the total deviation map and the FLV to the pattern deviation map seen on visual fields. A deviation map is calculated by comparing the thickness map to the normative databases. The machine also provides a "significance map" which illustrates the areas which have a statistically significant change from normal. The Spectralis (Heidelberg) measures the entire retinal thickness rather than the RGC layer. The machine scans the central 200 area, using 61 lines (300x250 OCT volume scan) to measure the retina thickness. A color-code thickness map is produced using a 8x8 grid centered on the fovea. The grid is symmetrical to the fovea-to-disc axis of each eye. It also displays the asymmetry between the superior and inferior hemisphere of each eye (hemisphere asymmetry). The machine also provides a mean thickness map. 3D OCT 2000 (Topcon) measures the RNFL thickness, the RGC with the IPL (GCIP) and GCC. It uses raster scanning of a 7 mm2 area centered on the fovea with a scan density of 128 (horizontal) X 512 (vertical) scans. The boundaries of the anatomical layers are determined by the program software using a validated, automated segmentation algorithm. The “macula inner retinal layers” (MIRL) analysis software analyzes a 6 mm x 6 mm region centered at the fovea. The software divides the macular square into a 6 x 6 grid containing 100 cells of 0.6 mm x 0.6 mm, to assess regional abnormalities in MIRL thickness. Average regional thickness of GCC, GCIP and RNFL in each cell is calculated and compared to the normative database of the device. Studies have found that the average GCC thickness for diagnosing glaucoma stages did not differ significantly among the 3 OCT machines. In a study using the RTVue, the mean GCC was found to have significantly higher diagnostic power than the macular retinal thickness in discriminating between normal eyes and those with perimetric glaucoma. A study of 3D OCT 2000 found that all GCC parameters decreased from normal to pre-perimetric glaucoma (PPG) and from PPG to early glaucoma. The values of GCIP and GCC parameters differed significantly among the 3 groups (p <0.001). However, the RNFL thickness of the macula between healthy eyes and those with PPG did not differ significantly (p <0.05). 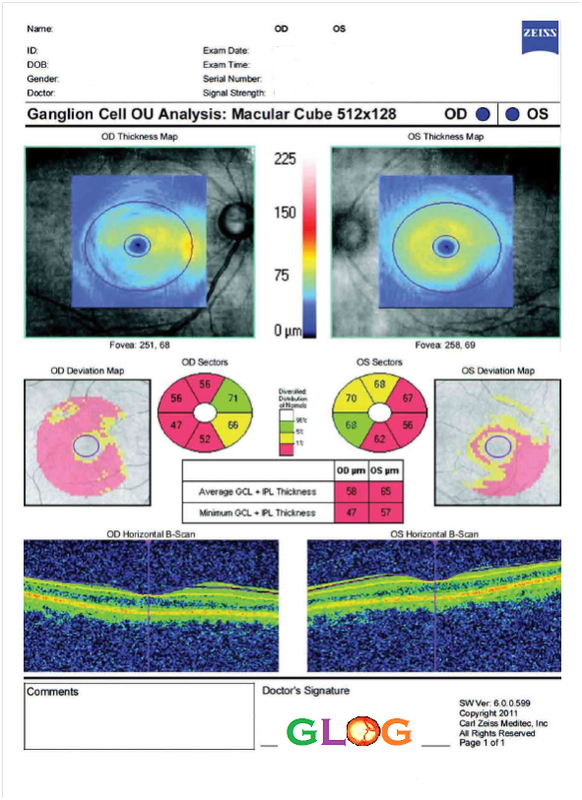 According to Meshi, structural evaluation (OCT) might be a more sensitive measure of ocualr health in early stage glaucoma, whereas functional evaluation (perimetry) may be a more sensitive measure of glaucoma progression in moderate-to-advanced stages. However, repeatability of the changes is important in evaluation of progression. Thinning of the macula can also be produced by aging, which needs to be excluded by other tests and clinical evaluation of the patient for glaucoma. Studies have also found that patients showing only hemifield changes on VF (the other hemifield being normal), showed changes in the GCC thickness even in the normal hemifield. MIRL parameters are comparable to those of cpRNFL thickness in diagnosing glaucoma early. This is especially useful when cpRNFL measurements are not reliable, such as in eyes with small or large optic discs, in tilted discs or peripapillary atrophy. A study by Iverson showed high specificity (91%) for GCC thickness parameters in normal eyes but only moderate specificity (77%) in glaucoma suspects. However, half of the GCC measurements classified as outside normal limits were not replicable on subsequent scans. There are some limitations of GCC analysis. The OCT machines only scan the macular region thus, information regarding areas nasal to the optic disc are not acquired. Abnormal thickening of the inner retina, such as macular edema and retinal fibrosis may lead to erroneous GCC measurements. The findings of individual machines are also not comparable to each other. OCT technology is evolving to provide better evidence of structural damage in glaucoma. It has been suggested that VF changes can be combined with GCC changes to develop an algorithm in order to better investigate the structural-functional aspects of glaucoma progression. It's a very informative and a piece of cake article, alot of thanks!